In the matrix above the axis term (first term sought) is TOP KILL, the name of the operation conducted by British Petroleum in its attempt to cap the oil spilling from their sunken Deep Water Horizon oil rig. This is the minimum ELS (most significant) occurrence of TOP KILL, found at a skip of -3501. In the 104-letter area with white background we find AND POUR THE OIL and THE SEA both at skip +1. By adding the area with a light blue background we see FAIL, the fate of the operation, but the matrix grows to 169 letters. 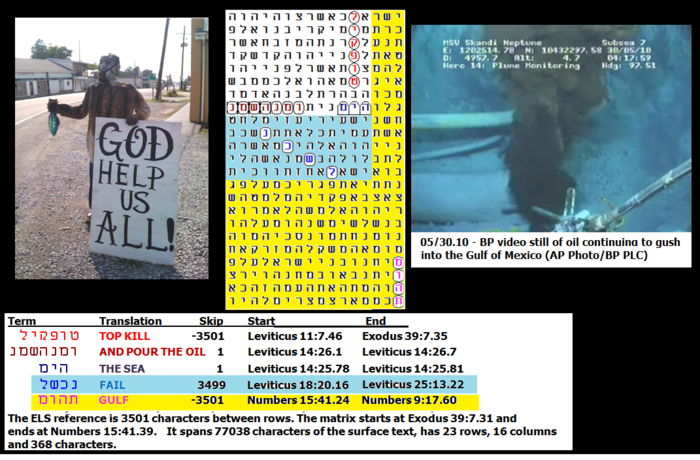 To see GULF at skip -3501, the same skip as TOP KILL, we must expand the matrix to 368 letters (the additional area is noted by the yellow background). Other matrices related to this oil spill are found on this site at OIL, UNCLEAN WATER AND END OF LIFE (http://www.arkcode.com/custom3_94.html); HALLIBURTON AND GULF OIL SPILL (http://www.arkcode.com/custom3_93.html): and LOUISIANA OIL SPILL DISASTER (http://www.arkcode.com/custom3_91.html). 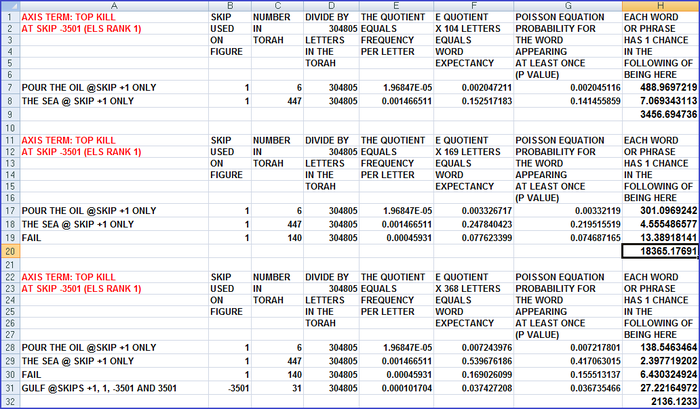 STATISTIC SIGNIFICANCE OF THE MATRIX. Whenever a matrix is sought, there is always a question about how large the matrix should be. A proper answer is linked to statistics. There are many approaches to this problem, and no agreement among the leading Code researchers about where to draw the line, but the spreadsheet below illustrates my protocol. 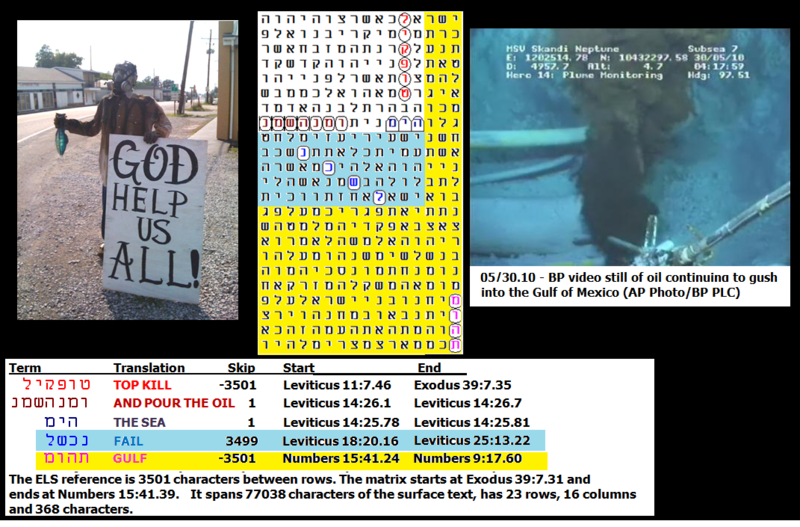 There was about 1 chance in 3,456 that we would find TOP KILL, AND POUR THE OIL at skip +1, and THE SEA at skip +1 in 104 letters. There was about 1 chance in 18,365 that we would find TOP KILL, AND POUR THE OIL at skip +1, THE SEA at skip +1, and FAIL at any ELS in 169 letters. 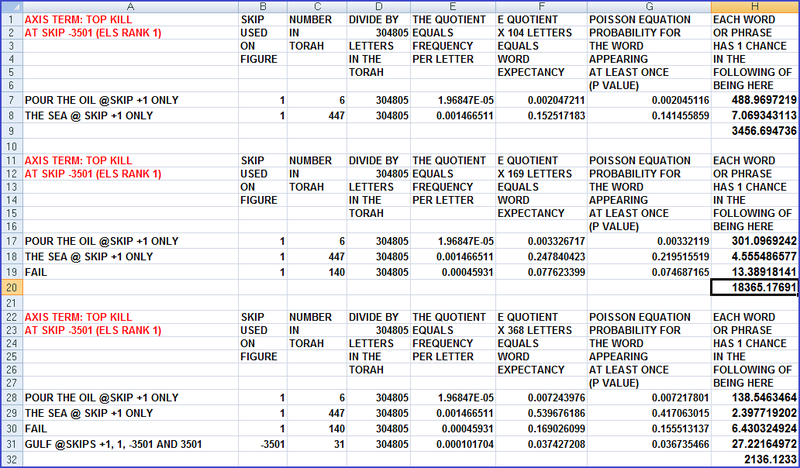 However, when the matrix expands to 368 letters to include GULF at a special case skip (here – that of the axis term +/-) or +1, -1, then the statistical values of the previously found terms drop, as does the overall value of the matrix to one chance in 2,136. So it pays to include white and blue backgrounds, but not the yellow background.